Tubbs Jones suffered an aneurysm. (CNN) - Ohio Rep. Stephanie Tubbs Jones remains in critical condition at a Cleveland, Ohio, hospital with limited brain function, but has not died, said Dr. Gus Kious, chief of staff at Huron Hospital. Democratic sources previously had told CNN Tubbs Jones had died. I wish her well and hope she recovers. She has stuck next to Clinton all year I hope Clinton is on her way. I am very sorry to hear the congresswomen death or any death for that matter. 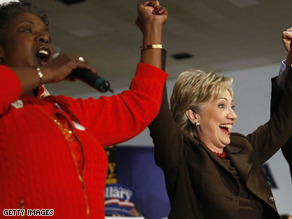 I wonder though If Obama shunning her and other black politicians who supported Clinton gave her the aneurysm. She's still alive!!! Thank GOD!! Pray for her!!!!! Man, that's a serious "WOOPS" on CNN's part. Hopefully she pulls through. There's no need for negativity on this thread. Tubbs Jones IS known for her ability to defend her constituents, which is her job. Disliking her for doing her job is as logical as writing in a third term vote for President Bush. CNN please don't give me a heart attack. What is going on? Hope she makes it through. My prayers are with her, her family , friends and the people of her district. This is why I love America. In a time of mourning people forget about politics and just see the human being. It is good to see. All my condolences to her family and may she rest in peace in a better world. What a terrible loss for our country. May her soul rest in peace. May her family be blessed and comforted at this time of sorrow. It does not matter what the political views are, a very fine woman has left us. God bless her life. omg – cnn you are joking right? how could you be so wrong about something so important! well if she isn't dead then i hope she gets better. Shame on you, CNN. I will keep you and her in thoughs and prayers and as was a long ago she is in good hands when she is in the hands of GOD. My heart goes out to her and her family. Watch the HRC haters will say something vulgar about this sadness. She's not died!!! She's still in critical condition and I hope she pulls through. She needs to be alive to see Obama get elected and the glory of our nation restored. What the hell CNN. You probably should confirm f someone is actually dead before you start reporting it. what a bunch of LAMES! Not so fast CNN! She is still hangin' in there. God Bless Her. CNN, How could you have reported without knowing for sure? I'm very sorry Stephanie Tubbs Jones is in critical condition. My prayers go out to her and her family. Shame on CNN. Journalists are supposed to CONFIRM facts before they report them. A phone call to the hospital is too much to expect from the "Best Political News Team" I guess. Oh thank God my prayers go out to her. Please, for this great woman, stay respectful on this thread. No time to make anti-HRC comments.